COMMACK, NY--(Marketwire - October 13, 2010) - An exclusive opportunity has arisen to own one of the last remaining mid-19th century North Shore mansions on Long Island, included within a 20-acre estate situated at the tip of Kings Point. The Kings Point Estate sits on a private peninsula with more than 1,600 feet of waterfront property and spectacular panoramic views of the Manhattan skyline, New York City bridges, Long Island Sound and Manhasset Bay. A true Gold Coast treasure, the waterfront property and its nine residential buildings are offered for sale at $39.5 million. Diane Polland, a sales associate with the Coldwell Banker Previews International division of Coldwell Banker Residential Brokerage, has the exclusive listing. "The Kings Point Estate is one of a waning breed on Long Island's North Shore," says Joe Mamone, president, Coldwell Banker Residential Brokerage on Long Island and Queens. "Its mid-19th century architecture, workmanship and spectacular gardens are unmatched. Strolling the property, with its mature plantings and serene privacy, takes you back to another time and place. What also makes its location unique is that within just minutes you can be in Midtown Manhattan." The Kings Point Estate played an important role in history, both local and literary; one of its earliest owners, John Alsop King Jr., is the namesake of Kings Point. The son of a New York governor, King Jr. constructed the main residence in the early 1850s, a stucco mansion designed by A.J. Davis, who also designed the Litchfield Villa in Prospect Park, Brooklyn. Richard Church, heir to Church & Dwight Company, makers of the Arm & Hammer baking soda brand, purchased the estate in 1913, and was known to have "Gatsby-esque" summer parties. In the early 1920s, author F. Scott Fitzgerald lived in nearby Great Neck and began writing his classic novel "The Great Gatsby." The Kings Point Estate is believed by some to have inspired the "West Egg" mansion at the center of the novel. While there is no documentation to tie the house specifically to the Gatsby's fictional mansion, Fitzgerald based "West Egg" on Kings Point, and Gatsby's mansion is located at the tip, as is the Kings Point Estate. It is not known for certain whether Fitzgerald attended any of Richard Church's elaborate parties at the estate, but living in the area, the author undoubtedly would have been aware of these gala events. The main house, a nine-bedroom, five-bath specimen of mid-19th century architecture and 1930s ornamentation, sits amidst 150-year-old trees and includes an attached conservatory. Just across the lawn at the very tip of the estate sits the Pavilion, formerly a pool house that in the 1960s was converted into an architectural masterpiece. With four bedrooms and five baths, the Pavilion features walls of glass that overlook spectacular views of both the Manhattan city skyline and sailboats floating peacefully on the Long Island Sound and Manhasset Bay. Separating the Pavilion and the main house is a beautiful marble swimming pool made of more than one million hand-laid blue and white tiles. From the main house through the serene English garden, past the large Koi pond and into the generous vegetable garden, sits the Greenhouse and Courtyard residences, three additional living quarters that feature a cobblestone piazza and squash court. A walk past the gentleman's farm and well-maintained vineyard takes you to Orchard House, a five-bedroom, four-bath home built in the 1970s that features high-sweeping beamed ceilings and a tennis court. Directly adjacent to the water and pebbled beach is the Silo House and Boat House. At the entrance of the long private driveway is the Cottage House. 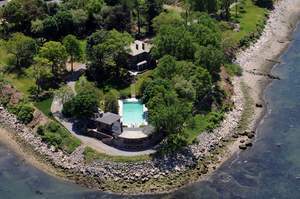 To learn more about this exceptional property, visit www.kingspointestate.com. Coldwell Banker Previews International is an exclusive program that specializes in the marketing of exceptional luxury properties. Coldwell Banker Residential Brokerage, a leading residential real estate brokerage company in Long Island and Queens, operates 15 offices with 750 sales associates serving the communities of Nassau, Suffolk and Queens Counties. Coldwell Banker Residential Brokerage (www.ColdwellBankerMoves.com) is part of NRT LLC, the nation's largest residential real estate brokerage company. A subsidiary of Realogy Corporation, NRT operates Realogy's company-owned real estate brokerage offices in more than 35 major metropolitan market areas. Realogy is the world's leading real estate brokerage franchisor. This stunning mid-19th century estate, situated on 20 acres at the tip of Kings Point on the North Shore of Long Island, is the exclusive listing of Coldwell Banker Previews International. Included are nine residences, sweeping gardens, a vineyard and horse stables.